Do You Need Any Rock Climbing Experience? No. Many of our guests are having their first climbing experience. Guides are specialized in client care and will do their best to make your first climbing experience fun and exciting. What Sort Of Physical Condition Must I Be In? Rock climbing depends mostly on lower body strength and balance. Our past clients have ranged anywhere from 5 to 80 years of age. While 9 is now the minimum age for attending our courses, Private Guiding and the Rock Climbing Experience are available for younger people. Yes, all climbing equipment is included in the price! This includes rock climbing shoes, harness and helmet. Always remember to bring layers of clothing, both uppers and lowers to adapt to the ever changing weather conditions. Where you decide to stay in the evening is up to you. 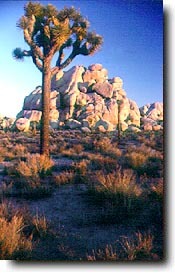 Camping is available for the Joshua Tree National Park location, as are hotels and bed & breakfasts. For camping information, directions, etc, click on "Directions, Camping, Lodging Information." How Far In Advance Must I Make Reservations? We prefer that you sign up at least 7 days in advance of the trip date. Please feel free to call us if you decide to join within the 7-day period, and we will do our best to accommodate you. Early registration helps avoid booked classes and disappointment. A completed reservation form and payment are required to secure your space. We accept personal checks, money orders, VISA, and MasterCard. Please call or email for more information. Upon receiving your payment and reservation form, we will email you a confirmation letter confirming your course name, course date(s) and meeting location. There is a 20% handling fee if we receive notice of cancellation or reschedule/ transfer more than 20 days in advance of the scheduled meeting date. If you cancel or want to reschedule/ transfer 20 days or less in advance for any reason, there are no refunds. There are no exceptions. Participants who don't show up for class forfeit trip cost. In the event of inclement weather, the guide will determine the morning of the class as to continue or reschedule the day. If the guide cancells the day you may reschedule or request a full refund. Once the day begins there are no refunds. This is official company cancellation policy. We will determine on the morning of the trip if it will be canceled due to inclement weather (extreme cold, rain, or snow). If it is canceled, you may transfer to another course date, or if this is inconvenient, we will refund any amounts paid toward the course cost. However, there are no refunds once the day has begun. We are aggresive guides and will do everything we can to make the day of climbing happen. So be prepared for both warm and cold weather. Call us at 1(800) 890-4745 or 1(760) 366-4745 or e-mail us at climb@joshuatreerockclimbing.com and we will be happy to provide you with any additional information you might need.